Erkner is idyllically located in the “Berliner Urstromtal”, a huge green and water-rich valley created by the last Ice Age, at the edge of an Ice Age Endmoränen-Formation. 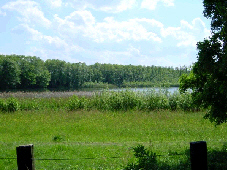 In a forest- and water-rich landscape between the lakes Dämeritz- and Flakensee and the rivers Spree and Löcknitz, surrounded by Berlin’s and Brandenburg’s forests, Erkner is the gate into the recreation areas southeasterly of Berlin. The visitor reaches the city usually per train and/or car. 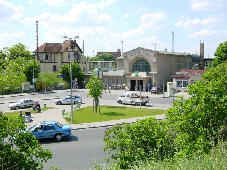 Directly at the railway station there is a P + R Car Park with more than 200 spaces, a central bus station as well as the Town Hall. From here it takes only a few minutes walk to the City Centre. The travelers who arrive via the freeway invite two large car parks for a rest directly at the town entrance. Here the visitor gets the first contact with the forest- and lakes rich landscape. Hiking friends find here the ideal starting point for extensive hiking tours on market routes through forests and meadows. Whom the city life offers more, can rich the centre after a few hundred meters. The Friedrichstraße forms the Magistrale of the city. 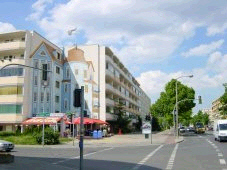 This main traffic route is running on historic ground and won through new constructions and redevelopments an increasingly municipal flair during the last couple of years. A Maulbeer-Tree and a Prussian postal service miles column remind of past times. Worthwhile is also the neo-Gothic Genezareth-Church opened by emperor Auguste Victoria in 1897. Many small shops and restaurants invite to a stroll. The stressed visitor finds only a few steps to one side of the main traffic route a peaceful and shady place in the Town Hall Park on the shore of the lake Dämeritzsee. Here there is a wharf for passenger ships, a managed public beach as well as a stadium. At the intersection Friedrichstrasse/Gerhart-Hauptmann-Strasse, the bright -yellow Villa Lassen is an eye catcher for the visitor. Here the Gerhart-Hauptmasnn-Museum has its seat. A permanent display of the life and work of the poet as well as a research library can be found here. Regular events e.g. concerts, authors readings among other things offer a varied program to the interested. A noticeable silhouette forms the tip of the apartment tower of the Education Centre of the Commercial Health Insurance and Pension Fund that that is illuminated in the evening. This building ensemble was erected in the middle of the 1990’s. It is also open to other associations, businesses or institutions and is suitable especially for seminars, symposiums, workshops, conferences or congresses. In a building of the former Bakelite production plant in the Flakenstrasse, the Institute of Regional Developments and Structural Planning (IRS) has its seat. The institute is an efficient and interdisciplinary working research institution of the Room Sciences. For the interested one in the homeland the museum of local history is highly recommended. 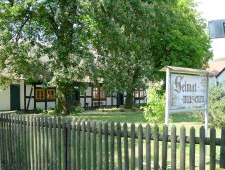 That around 1760 erected building is heritage protected and belongs to the few still well preserved rural half-timbered houses in the Mark Brandenburg of the Friderizianician Colonization Time of the 18th century that has a thatched roof. In the 1990’s it was completely refurbished and includes a local historic collection. The local homeland society lovingly looks after the museum that offers regular events. Vis-à-vis the museum of local history there is the building of the Fire Brigade and Ambulance Service that was erected in 1994. 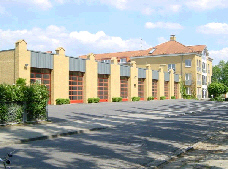 Well trained women and men guarantee on the voluntary basis the Fire Brigade Service in town. The Ambulance Service is covered by the Johanniter-Unfall-Hilfe. Directly behind this building is in a meadow area there is the lake Karutzsee, an idyllic spot that offers excellent views for the friend of nature. The hiker can direct its steps further toward Karutzhöhe and Hohenbinde to the River Spree and finds at the same time sufficiently relaxation in the forest- and water-rich area. Through the circle traffic completed in October 2001, Erkner’s traffic connections to the surrounding countryside have improved significantly. The circle traffic and the train underpass guarantee that our visitors can comfortably reach further interesting excursion destinations.